One of the objective of our project is to promote our two outputs: the EMSA free and anonymous web-tool and the Energy Angel network. 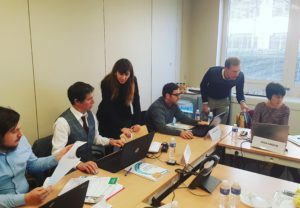 Moreover, another objective is to train future Energy Angels about the specificity of energy efficiency in industries with a specific focus on water processes. In-person training sessions (of 1 or 2 days), in France and Spain in 2017 and in Spain, Belgium and Italy beginning of 2018. Webinars (2-3 hours), in UK and Italy in 2017. These events were successfull and allowed the collection of very important feedbacks about the EMSA web-tool. It has permitted us to improve the tool and co-build a tool which will be easy to use, efficient and robust. The EnergyWater project is going to pursue organising trainings all around Europe in 2018, firstly by organising additional webinars. Moreover, additional webinars and in-person training session will be organised in 2018 in different countries and will be announced on the website. For any aditional information, please feel free to contact Sonia Siauve (OIEau) at : s.siauve@oieau.fr or +33587753119.